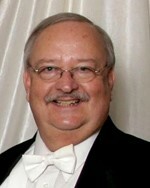 Denver Seifried retired from Greenon Schools in 1995 after 28 years as instrumental music educator. he is a member of the Symphony’s Brass Quartet and Quintet. and the Wright State University/Community Trombone Ensemble. The Producers, Four Girls Four, Pirates of Penzance, Beauty and the Beast and A Chorus Line. He is also first-call bass trombone and tuba for the Wright State University Theater Department for WSU musicals. and a Master of Music in trombone performance from the University of North Texas. He has studied bass trombone with Betty Glover, formerly of the College-Conservatory of Music at the University of Cincinnati. He joined the Wittenberg University Department of Music faculty in 2000, as an adjunct trombone and bass trombone instructor.